Dr. Darrick Smith deconstructed these historically oppressive education models, after which about 150 attendees reassembled them with current meaning at Re-imagining Our Education in the Stevenson Event Center on March 6. Smith demonstrated how this dominant pedagogy mirrors the U.S. higher educational institution’s emphasis on prestige, not growth. Dr. Darrick Smith speaks at Re-imagining Education, a student-organized event on Tuesday evening at the Stevenson Event Center. Dr. Smith is an assistant professor of education and leadership at the University of San Francisco. Students discussed themes of student agency and educational justice. Photo by Calyse Tobias. Smith is a UC Santa Cruz alumnus who helped establish the Black Men’s Alliance (BMA) during his undergrad, and is current associate professor of education and leadership at University of San Francisco. He was asked to speak at Student Organization Leadership Body (SOLB) and SOAR, Student Media and Cultural Arts and Diversity (SOMeCA)’s event in response to the administration’s Strategic Academic Planning (SAP) initiative. The SAP initiative intends to identify the academic strengths of the university, and to prioritize funding in ways that accentuates these strengths. Two committees are charged with overseeing the process and evaluating the university’s academic strengths. Donnaven Bradley, SOLB member and Black Student Union vice president, said SOLB is concerned these committees will not be able to make decisions that reflect the diversity of the campus. Of the 36 people involved with the process, only two are students, and people of color are not proportionally represented. Smith said because UCSC is a research university, faculty are chosen based on their ability to conduct research, not their teaching skills. Smith said this criteria is to produce a product, not to educate undergraduates. This model of instruction and information regurgitation does not allow students to think critically or challenge curriculum, Smith said. He also said because this model originates from Eurocentric pedagogy, it does not allow space for people from diverse backgrounds to optimize their education. After the keynote, student leaders facilitated a roundtable discussion to give a platform to and document a representative student experience at UCSC. When asked how he felt about Smith’s talk, Walter Manuofetoa, third-year transfer critical race and ethnic studies major, said he resonated with experiencing the banking model of education at UCSC, in which students are asked to memorize information for exams. 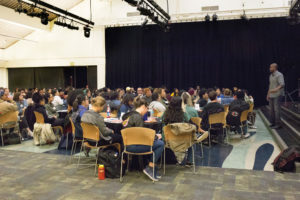 Compared to Manuofetoa’s community college, everything from the classroom setup to the teaching assistant grading his exams and a lack of racial representation at UCSC created a disconnect between him and his professors. Groups also discussed ways in which UCSC could incorporate liberation into education. Students brainstormed requiring professors to get a teaching credential, evaluating curriculum in ways that don’t erase or invalidate indigenous experiences and campus-wide surveys regarding student opinion of education. SOLB member Donnaven Bradley encourages students to know they have the ability to organize agency in or outside of class. He said it can be as simple as starting conversations with professors and peers or recognizing students are not pawns of the university.